Washington – The race for the 5th District seat got a little more crowded Thursday as Simsbury Republican Liz Peterson and fellow Republican Ruby O’Neill of Southbury said they are running. Peterson, 49, has only lived in Connecticut since August. Before that she lived in California, running several political campaigns there. She has lived in Connecticut before, however, and is a Trinity College graduate. She currently serves on the Simsbury town committee. “I wanted to get back to New England so my kids would have some of my childhood,” Peterson said. Surrounded by Republican supporters, Ruby O’Neill announces her candidacy. Behind her is her husband, State Rep. Arthur O’Neill. O’Neill, 64 , is a member of Connecticut’s Latino and Puerto Rican Affairs Commission. A native of Honduras, O’Neill emigrated with her family to the United States in 1954. She is a founder of the National Latino Republican Coalition. 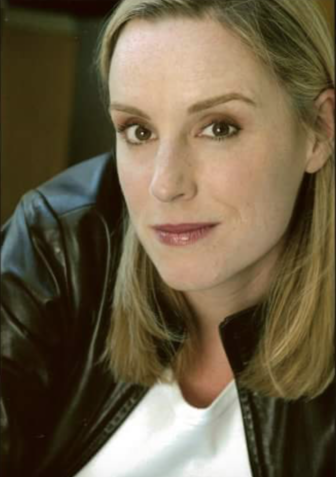 She is married to state Rep. Arthur O’Neill, R-Southbury. 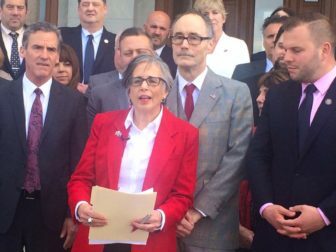 “I can connect with the population with whom the Republican Party has not traditionally connected … and that’s the Latino community,” O’Neill said at a press conference on the Capitol steps in Hartford on Thursday. Introduced by several GOP members of the General Assembly, including Rep. William Petit, who had considered and thought better of running for Esty’s seat, O’Neill said Connecticut has “serious issues,” and wants to become a member of Congress to help. “Like other people across Connecticut, the people of CD-5 are struggling,” O’Neill said. She said she entered the race so Connecticut, currently represented by an all-Democratic congressional delegation, had the chance of having more clout in Washington. “I want Connecticut to have a voice in a Republican administration and a GOP Congress,” she said. Democratic Rep. Elizabeth Est has represented the district since 2012. But, after severe criticism of the way she handled a chief-of-staff accused of abusive behavior, Esty decided she would not seek re-election, leaving an open seat that allows for a competitive race in what is considered a swing district. The other Republican in the race is former Meriden Mayor Manny Santos, who declared his candidacy before Esty bowed out. Peterson, O’Neill and Santos will now have to scramble for the support of delegates to the Connecticut Republican Convention, which will be held on May 11-12. The only declared Democratic candidate in the race is former Simsbury selectman Mary Glassman. John Pistone, who calls himself a “2018 Christian Conservative Candidate,” also said he is running as a Republican in the race, but has not yet filed a statement of candidacy with the Federal Elections Commission. There may be others who enter the race. Nicole Hockley and Mark Barden, co-founders of Sandy Hook Promise who’ve each lost a child in the Newtown shooting, have been urged to run by Connecticut Democrats and the Democratic Congressional Campaign Committee, but have not made up their minds. Middletown Mayor Dan Drew, another Democrat, is also eyeing the race. Staff writer Mackenzie Rigg contributed to this story.